The amount of public interest events that I'm missing out on - on a daily basis - almost feels criminal. In terms of hydro-electricity power generation in AJK, we are literally witnessing daylight robbery by our neighbour. 1960s Mangla is being repeated in quick succession in Muzaffarabad Division. The environmental fall-out has brought the citizens of Muzaffarabad out onto the streets today. Recovering fast today, as I finally got my hands on some genuine honey. Into my 12th day of an illness that I still can't shrug off. I really like that note. It's so re-assuring coming from such an age-less writer. Earlier in the day, I tried to send the following fax to Malaysia from Dadyaal in AJK. I learned that you can only send faxes to Pakistan - from anywhere in AJK - and nowhere else beyond! We are not sure whether this is the appropriate forum to make a formal application for FIFA (and by extension AFC) membership, with a view to participating in the qualifying campaign for the next world cup in Qatar 2022 (from Asia). Our 'country' is officially described as Azad Jammu and Kashmir (AJK is an acronym) and it translates as the free part of Jammu and Kashmir, which is intermittently but fiercely contested between India and Pakistan. Our territory boasts having its own prime minister, president, supreme court and constitution with a clearly defined territory including an over 1 million strong diaspora in the developed world. We are a keen footballing nation and are confident of qualifying from Asia. We would be grateful if the AFC can guide us on how and what are the appropriate steps that we need to take. In reference to the above email, a phone conversation was attempted on the 7th of September to the following phone number 00 603 8994 2689, as no response was received via email. I was put through to a lady whose name I was informed to be Ms Elia. However, despite a couple of attempts I could not get through to her either. Now that I haven’t received a response via email or the phone, I am attempting to contact AFC via fax. If I don’t receive a response via this method either, then I will contact FIFA directly. Yes, I did miss the midnight deadline yet again. ..........What I am trying to explain is that we are practising a self-defeating exercise for decades, in the context of searching for a solution for the J & K national question. ......Pakistan hides behind the suffering of the Muslims in the Kashmir Valley. .. India hides behind the interference in the Kashmir Valley by Pakistan. ........Britain hides behind both of them and says the J & K question is a matter that only India and Pakistan can resolve. ........Both countries have no such intention as the conflict is ingrained in their 'nationalist' psyche. If they resolve their differences, it would make the British created partition in 1947 look absurd. .......By not allowing AJK to emerge as an independent entity, we are all complicit in this crime. Consciously or otherwise. ...........Without an independent political entity in the erstwhile J & K, there cannot be a genuine internal dialogue between state subjects which would also obstruct external interference. .......That physical space has to be AJK. Even in its diaspora, it has a very significant block of votes that can influence over 50 MPs in the House of Commons. The very house that blessed the birth of India and Pakistan. .....A solution cannot emerge from the Kashmir Valley as it is at the centre of contest. Cool and calm temperatures are needed for dialogue. We have even selected a precise physical location for it in AJK. ....the International Community has no inclination to rock the boat in the region while China is taking full advantage of the status quo-ism of the rest. Despite all the above, many of our co-citizens are still forlornly waiting for decades, for somebody to help them. Studying a film of London made in 1956. I know London like no other city in the world. I haven't spent as much time in any other city either. 62 years later, its almost a replica of itself. So much so that I am astounded. Baker Street, the Evening Standard, Parliament Square, Waterloo, Park Lane, Knightsbridge, Kensington, Bayswater and the list is endless. My enemies are playing cat and mouse.....and probably some other games too...simultaneously. My health has deteriorated in the past few days and yesterday it took a turn for the worse. What began as flu (from eating a peach that had spent much of its life in refrigeration) gradually became a fever and now involves a lot of coughing and phlegm. Apart from that peach, eating food every day in the bazaar of Rawalakot for the past 3 months has finally taken its toll. The weather has also shifted from mild to cold corresponding to my illness. I'm fighting it like I fight everything else that obstructs my path to re-activating human civilisation in AJK. The most enlightened confirmation of Pakistani society that I’ve heard from a Pakistani, possibly ever. So much so that I’m going to share this text on my blog. Meanwhile, Mahmood Ahmed Musafir managed to get an audience at the Islamabad Press Club yesterday, after all. At a cost of 30,000 PK rupees (almost £200) which was scrambled from the local citizens of Kotli. Nobody from the AJK diaspora contributed, as yet. Imagine if a poor person or people without any access to a potential pool of donors wanted to inform the media of something that related to genuine public interest in Pakistan. Where do they go? Isn't the criteria money after all? Not genuine public interest? How does 'Naya' (new) Pakistan differ from the old one? Despite holding a press conference at the risk of foregoing one of his kidneys as collateral for the huge expense involved, there appears to be no Pakistani TV coverage of his issue whatsoever and little to no coverage in the press either. In some senses, I feel more sorry for the State of Pakistan than I do for Mahmood Ahmed Musafir. The paucity of economic opportunity in Pakistan is astounding. What a pitiable plight for a nation so keen on expansionism over the past 70 years. (Yesterday - Day 256).....I lost the net facility I had temporary access to, that's why it's being added today. These are testing times. I am relishing them as much as I am suffering from them. I am contacting an increasing number of co-citizens at home and abroad. At this stage, most are ignoring my request. Some have assured me of co-operation and even less have actually contributed. Salaam to the local citizens of Kotli for paying 30,000 Pakistani rupees (almost £200) for this public interest activity. Those of who are part of the AJK diaspora, try and get in touch with reality back home. You wouldn't be where you are if your forebears hadn't toiled the land here. Try and bring dignity to it. I also found it fascinating that the UK (United Kingdom) isn't in the top ten. So much for spending most of my life there! This latest break from blogging has been for an unusual reason. The monthly net package on my device finished on the last day that I blogged (Day 248). I still haven't been able to buy a new package, for reasons that should be obvious to all those people that are familiar with my work. These are very challenging and interesting times. 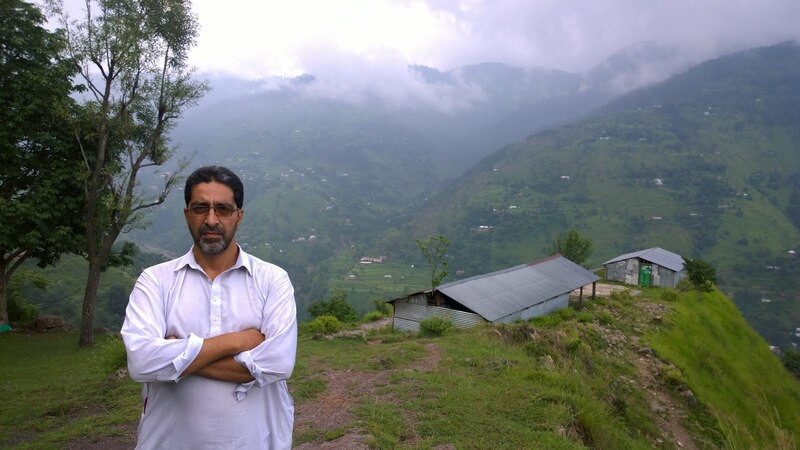 Despite the difficulties involved, I am relishing the challenge as it is enabling me further examine the relationship between me and the public of AJK, most specifically the public of Rawalakot. It is also making me gradually more disciplined and of course more determined. The few local people who are helping me survive here are from the relatively disadvantaged economic class...though I'm always reluctant to use the term 'class' when discussing or analysing society. It's a much over-used term in my opinion. Some of the rich people I've met pretend to be poor and one even shed a bucket of tears for me. He felt that Pakistan's roving agencies would kill me imminently. He didn't want to see another precious soul die. I understand that he's quite well off but he didn't spare as much as 10 rupees for the work I do. Is it fear, is it selfishness, is it insecurity or is it a lack of grasping the mechanics of public interest? I've approached the stage where I have to change my approach towards my co-citizens. Public policy operates on public finance and although we have taken a few leaps in getting this message across AJK since 2012 - our strategy has been quite reactive to date - in the sense that funds were always raised from the public on an ad-hoc or as per immediate need basis. It can no longer afford to be so. The attitude of our public to those who work solely for the collective benefit of society - is on the whole - quite pedestrian. That does not mean that they don't contribute or value those who work for them on their own initiative. Indeed, at least two-thirds of the local population contributes. It's just that they are not as alert as they need to be or proactive enough. In my specific context, my overheads have sharply risen in the past 14 to 15 months. Hitherto, I lived at my family home in the village. There was no rent to pay or even any utility bill to deal with. The children's school tuition fees were also comparatively modest. There were even times when we got through the whole month on less than 3,000 Pakistani rupees (less than £20!). Now, I have to find 30,000 Pakistani rupees (about £189 at current exchange rates) every month just to keep my family afloat. This doesn't include expenses for public activity and its related costs. Throughout my 13 year 'tenure' here, I have avoided debt as I feel that it to be anathema for a public activist who relies on the goodwill of the people he's working for. However, as I write I have approached a debt burden which is coming close to 1 lakh rupees (c. £629). Thus, I have to be pro-active now and accumulate funds so that all necessary expenditure in public interest can be met in a timely manner. These costs will only increase with time as our public interest research (and activism) intensifies. I hope our citizens - especially those enjoying the fruits of democracy in the diaspora - pay heed to this need. I find this position intriguing, not because of its veracity or lack of but because it touches on an angle not much discussed in mainstream Indo-Pak discourse. I vave no axe to grind. I have almost lived my life. Back in Rawalakot. Back to a sweet temperature. So much so that I had to wear a sweater on my walk to dinner in the evening. Meanwhile, I have no more time at my disposal. It all seems to be booked till death. As I write in darkness for want of electricity, my co-citizen Mahmood Ahmed Musafir maintains his hunger strike for more than a hundred days while sitting less than a kilometre from Imran Khan, the new chief executive of the country that ignores Mahmood, not least because he can help resolve the shortfall of electricity with his alternate power generation plan. We live in a fascinating era.